IRVINE, CA--(Marketwired - Dec 11, 2013) - Nihon Kohden America, a market leader in patient monitoring breakthroughs, has just completed the expansion of its North American operations into a state-of-the-art, built-to-spec facility located in the heart of Irvine's Technology Corridor. The company has achieved double-digit growth over the past decade, and had outgrown its previous facility. Nihon Kohden America's new, 51,000-square foot facility has enabled the hiring of additional staff to support the company's growth plans, and includes a showroom that will display solutions from all of its product lines including monitoring, neurology and cardiology. In addition, the new location features a cutting edge training center that will host regular customer education and training sessions. Nihon Kohden America is strategically located in the center of Orange County's booming medical equipment market -- recent studies show more than half of the county's $9.5 billion in economic activity for 2013 was directly related to the medical equipment field. Mike Dashefsky, vice president, Nihon Kohden America, attributes the company's vibrant growth in patient monitoring to its unique mindset and way of doing business, which emphasizes 'different thinking for better healthcare.' According to Dashefsky, "Customers find our business model -- which gives complete transparency and allows for financial predictability -- a refreshing change of pace from the traditional way of conducting business. Nihon Kohden America is transforming the patient monitoring industry by focusing on improving patient and financial outcomes. We actively collaborate with customers to solve their challenges, and that leads to success for all parties involved." Nihon Kohden America's expansion comes at a time that finds the healthcare industry shrouded in chaos and uncertainty. Dashefsky notes, "The introduction of the Affordable Care Act has created harsh economic times for hospitals, making transparency more important than ever. Hospitals are at a crossroads, and are looking to pioneers like Nihon Kohden America that realize change is needed and bring innovative thinking to the table." Nihon Kohden America's Enterprise Monitoring solution uses extremely advanced, yet cost-effective technology to provide clinicians with the critical data they need -- when and where they need it. Empowering clinicians with this information results in quicker interventions and better quality outcomes. The company's Enterprise Monitoring system integrates with the vast majority of EMR systems on the market, and includes a 5-year parts and labor warranty, free software upgrades for the life of the system, free software enhancements for the life of the system and technical support at no charge. For more information, please visit www.nkusa.com/monitoring. The monitoring division of Nihon Kohden America is empowering hospitals to radically improve their quality and economics of care. Its singular focus is on patient monitoring. Through collaboration with hospitals, Nihon Kohden America helps solve today's healthcare challenges. This different mindset and business approach enables the company to deliver solutions that have an immediate clinical and financial impact. Find more information at www.nkusa.com/monitoring. 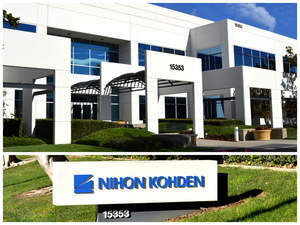 To support its continued growth, Nihon Kohden America has moved its headquarters to a larger facility in the heart of Irvine's Technology Corridor. The new location features a product showroom and a cutting-edge training center.